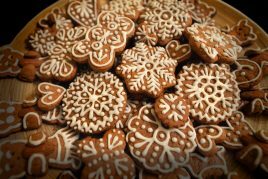 These simple ginger biscuits are perfect to make with kids during the holidays, and they make a lovely gift. Sift in flour, cinnamon and ginger. Fold in with a wooden spoon. Shape into two balls and knead into a doughy consistency. Put in the fridge to chill for 30 mins. Roll out one ball at a time, to about 5-8mm thick, and stamp out your festive shapes as desired. Place shapes onto greased baking sheets and bake for 10-12 mins until slightly risen and golden brown. Cool on a wire rack – they’ll keep in an airtight container for about a week.